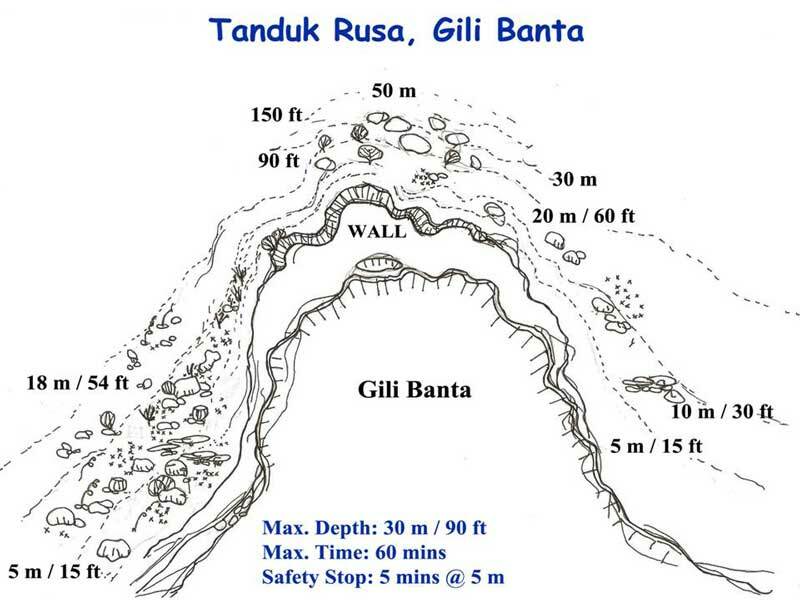 Tanduk Rusa is located off the north-westernmost point of Gili Banta (Pulau Banta), an island about eight kilometres across and eight kilometres north-south. 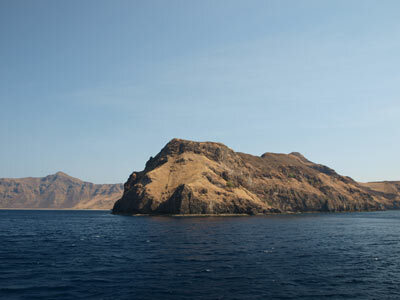 Gili Banta is located between Sangeang Island, Sumbawa Island and Flores Island. Its alternate name of Roller Coaster comes from what happens when you do the dive (see later). An approximate GPS mark for the dive spot is 8º 23' 33"S 119º 16' 31"E (using WGS84 as the datum). The site is around the point to the south of the GPS mark. The point actually looks like an elephant from the east. 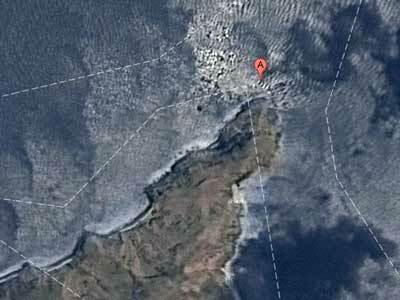 The actual dive site goes from the south of the point around the point to the west and south-west. 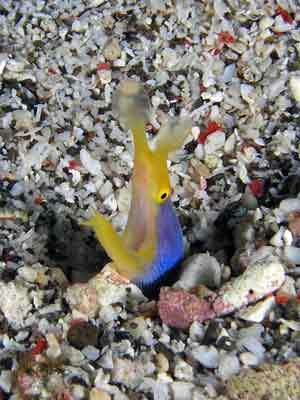 A current is used to determine what happens on this dive. As with virtually all dive sites that you do when on MV Mermaid II, you use the RIB (rigid inflatable boat) to get to the start of the dive (and also to get back to the boat). The RIB will drop you normally a hundred metres to the south of the point. 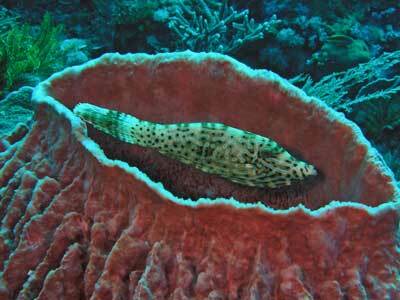 The reef here is a wall that drops from above the water down to at least 40 to 50 metres in a very steep drop. 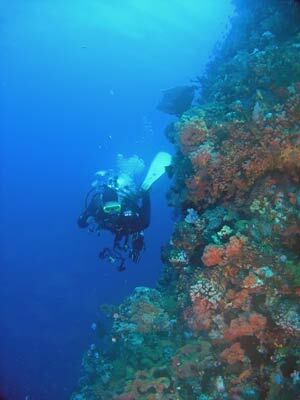 Once in the water, we drop down the wall to about 8 metres. The current takes us to the north and also pushes us down a bit to about 18 metres and then we are pushed up over the next few minutes to about 12 metres. The alternate name of Roller Coaster comes because of the way the current pushes you up and then down and then up again. After five minutes we are pushed down again, this time we go to 26 metres over a few minutes. I add air to my BCD to make sure that I do not get pushed further. We soon come to the corner and shoot around and start heading to the west. Within a minute or two the current has stopped. At the corner there are some very large boulders down deep. It would have been interesting to have been able to examine them. We ascend over this time from 26 metres to about 20 metres. After another few minutes the current picks up a little, but it is mostly coming into our face. It seems there is an eddy effect occurring. We start gradually ascending as we head west or south-west. 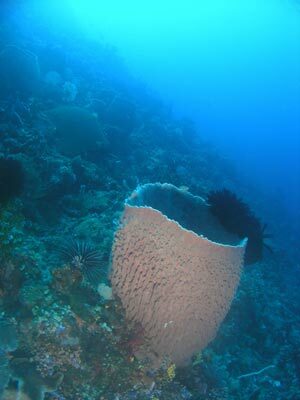 The reef drops off fairly steeply to our right, but we move shallower as we go. After about 20 minutes there is a very loud explosion. It is not as loud as the one on the third day, but it was loud enough to physically shake your body. More dynamite fishers at work. 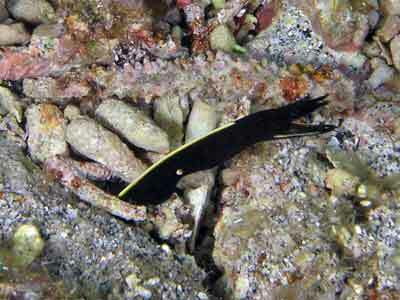 We find a blue ribbon eel and then a black ribbon eel (black ones are either the juveniles or females - this is a juvenile - and blue ones are adult males). Another blue one is seen a bit later. 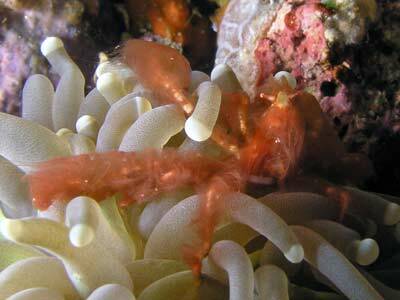 There are also orangutan crabs, one of which I get a very nice photograph. A few minutes later I hear a lot of clanging. 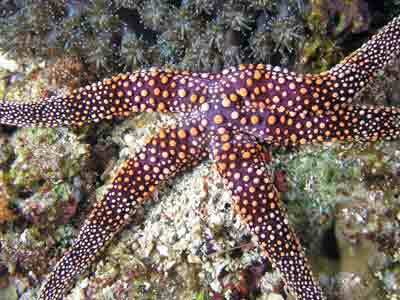 The dive guides bang their stainless steel pointers on their tanks when they see anything of interest. This banging indicates something very good as it goes on for a while. 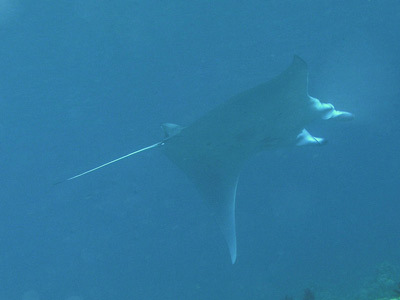 About a minute later a reef manta ray comes from the south-west and swims past us and then returns and heads back to the south-west. Brilliant. I spend the last 10 minutes in five metres doing a safety stop. There is more to see here which means you are never bored. This was a very good dive, albeit a bit scary at the thought that you could be pushed deep without wanting to and you could damage your ears if you have problems equalising. The visibility was 30 metres and the water temperature was about 27ºC. Click here to return to see the dive profile from my computer.